John Berry has released a lyric video for his new single, “Beautifully Broken,” which is the featured title-track for the upcoming movie of the same name. The exclusive announcement was featured on Center Stage Magazine and My Jam Music Network. The inspiring single is climbing the MusicRow Charts and currently at number 38 after a 22 year span between hit radio songs. Watch the lyric videohere. 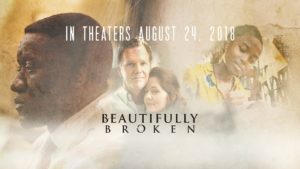 The movie, “Beautifully Broken,” is based on the true story of two families from different worlds, each facing a crisis beyond their control. As their lives cross, together they find hope rising out of tragedy. This journey reveals the divine tapestry of God’s love and guidance, where they learn first-hand the power of forgiveness and reconciliation, and the healing that comes from helping others. Watch the movie trailer with John singing here. “Beautifully Broken” is based on the true story of two families from different worlds, each facing a crisis beyond their control. As their lives cross, together they find hope rising out of tragedy. This journey reveals the divine tapestry of God’s love and guidance, where they learn first-hand the power of forgiveness and reconciliation, and the healing that comes from helping others. A refugee’s escape, a prisoner’s promise, and a daughter’s painful secret converge in this inspiring real life story of hope. As three fathers fight to save their families, their lives become intertwined in an unlikely journey across the globe, where they learn the healing power of forgiveness and reconciliation. In 1994, the Mwizerwa family lived through the horrific genocide in Rwanda where nearly one million people were killed in just one hundred days – including their parents and most members of their extended families. By the grace of God, William’s family (his wife, Ebralie, and their four children) survived the massacre. Running from their home without taking anything, they made a dangerous journey to Nairobi, Kenya. William came to the United States in May of 1998 and became very active at First Presbyterian Church in Nashville.